Hi! 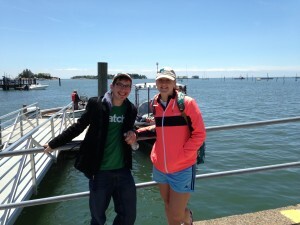 My name is Rachel Ingraham and I am a graduating senior at Branford High School. At Branford High School, seniors have an option to take part in a full time internship for the month of May. The purpose of this internship is to give us a practical experience in an area of interest to us, which helps us determine whether we want to continue with that interest in college, or as a career out of high school. Next year I am attending Assumption College and am majoring in Environmental Science with an aspiration to follow through with Environmental Engineering or Environmental Law. For that reason, choosing to intern with the Branford Land Trust was a very logical choice for me. Over the month of my internship I have been working closely with my sponsor Bill Horne and with many other valuable members of the Land Trust. Some of the work that I have done includes marking boundaries and GPS-ing trails around Land Trust-owned properties with Larry Wheeler, monitoring osprey platforms with Jon Clark, and attending Land Trust meetings to learn about all the wonderful things that the Land Trust does for the town of Branford. I also participated in work parties to keep trails clear and I helped Martha Rice count horseshoe crabs for Project Limulus (Sacred Heart University). One of my favorite projects during the month I interned at Branford Land Trust was volunteering at Outer Island, part of the Stewart B. McKinney Wildlife Refuge. On my trips out to Outer Island I met with fourth grade students from Barnard Environmental Studies Magnet School in New Haven who were taking part in the New Haven Harbor Watershed Urban Wildlife Refuge Partnership program with the U.S Fish and Wildlife Service. 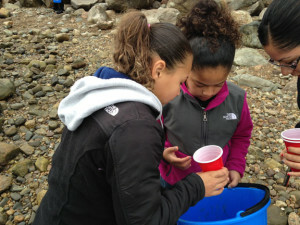 The Partnership with the New Haven school system is one of only eight Urban Wildlife Refuge Partnerships in the nation. The mission of the Urban Wildlife Refuge Partnership is to improve and create protected wildlife habitats in urban areas and, also a huge importance to the Partnership, to teach children hands-on the need for protecting and conserving habitats. Prior to the students venturing out to the Island, they were prepped in the classroom with lessons from the U.S Fish and Wildlife Service. 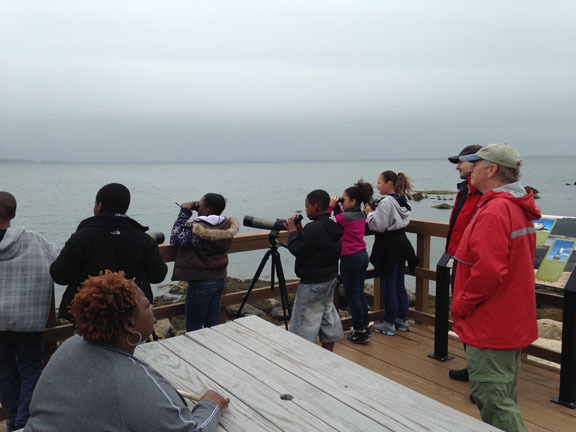 In their classes, the students learned about Outer Island specifically and the habitats and wildlife it contains. They learned what exactly a habitat is, what it means for a species to be invasive or endangered, and lastly they learned about the wildlife that roams on the beautiful island, from the crabs to the birds. It was wonderful to see children so excited to be involved in their environment and having so much knowledge of the area before they even got out there. Out on the Island the students rotated in stations to learn about each part of the island. During the morning I helped the students use binoculars to search for and identify birds flying around the island. The students and I were able to find Oystercatchers, Seagulls, Geese, Cormorants, and Mallard Ducks. The students were all very observant and told me every color they saw on each bird, and were very excited and interested in each new bird they found. 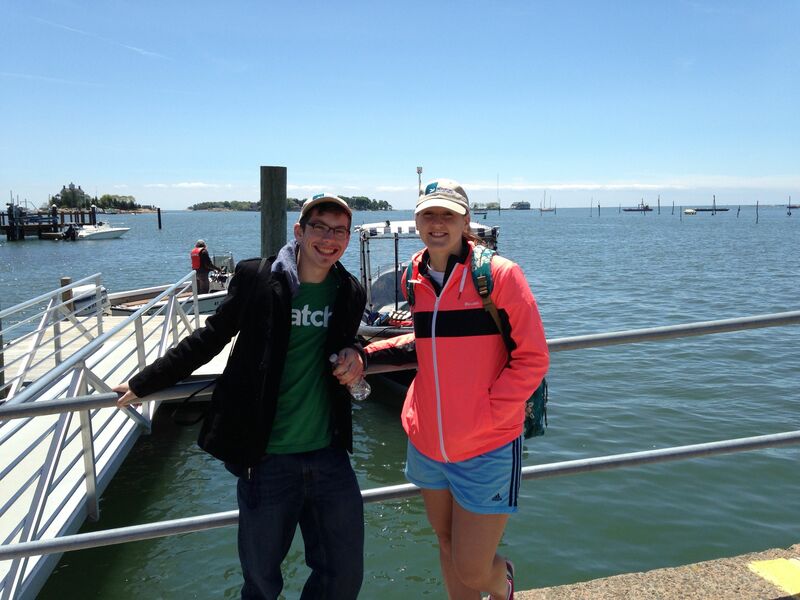 The next station I helped participate in was research on the invasive Asian Shore Crab. Students were told to collect 10 random Asian Shore Crabs, and then we taught them how to determine the gender. 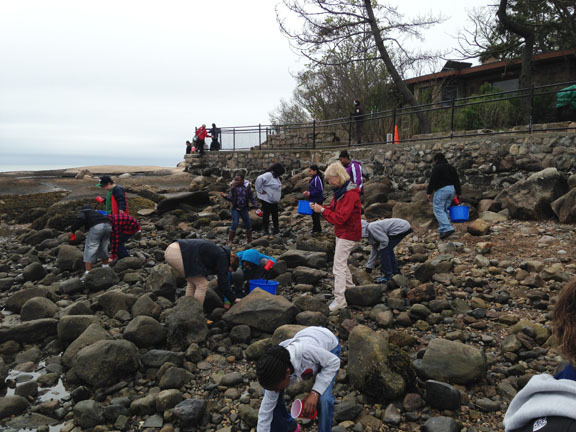 Students were also told to measure and weigh the crabs to compare the data to previous studies done each year at the island. The students were interested to find that A) there were plenty of crabs out there and B) there were more male than female crabs on the island. The students observed a female crab carrying eggs and learned that each female crab produces so many offspring that they don’t need many females to keep the population going. One of the groups of students was on the island when the tide was high and crabs were in the water. 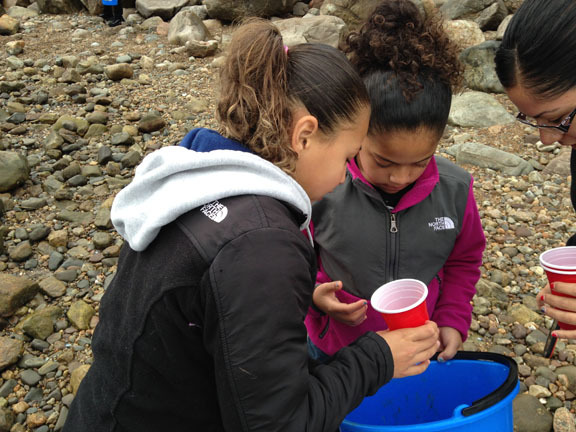 These students observed Periwinkle Snails which were easy for them to find as they covered the entire island. They were equally as excited to find snails as they were about the crabs! 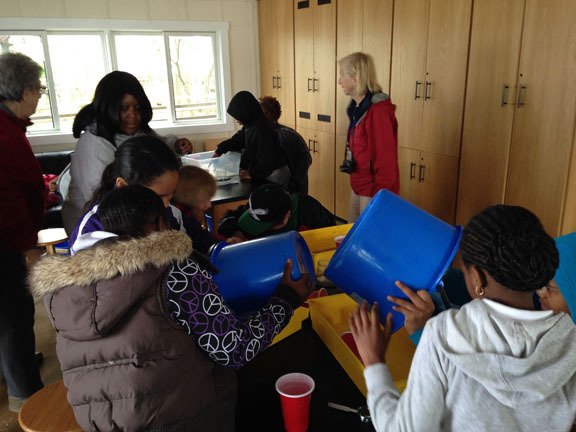 The final station that the students went to was the Water Quality station. Students were given a device that showed them how much salt was in the water and then they took the temperature. First we gave the students fresh water from a Poland Springs bottle, which oddly enough they ALL thought would contain salt. Unfortunately (or fortunately!) they were wrong and our drinking water does not contain any salt, but they did find that our water from the Sound is pretty salty, and also very cold still! 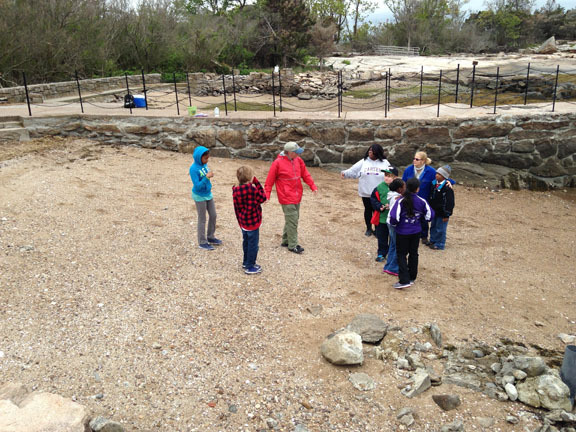 After testing the water at the beach, we made our way to the tide pool and the students did the same thing as they did at the beach. They predicted that the tide pool water would be much colder than the water at the beach. Again they were wrong because the water was much warmer (which thoroughly shocked, but excited them), but the salinity remained the same. The students were very excited to be taught about the salt content and temperature of the water, and they couldn’t believe that their predictions were wrong which kept them talking until they left the island! Volunteering at Outer Island was an amazing experience for me. It was great to see students so enthusiastic about learning about the environment and I was impressed by how they already had so much knowledge about the environment prior to their trip to Outer Island. Unfortunately, I don’t remember having an experience like this when I was their age, or knowing half the information that they do. The fact that programs like this are being introduced into schools is a huge step in the right direction for education about the environment and environmental concerns. All these young people are eager to help in any way with bettering their environment! During my month working with Branford Land Trust I have become more secure in my belief that Environmental Science is a subject that I want to pursue in college. I am so grateful for the experience that I have been given and thankful for all those that have taught me about new topics and opened my eyes to new opportunities/concerns with the environment in Branford. Before my internship with Branford Land Trust I was at a loss about how I could help the environment in my community, but now I know exactly what I need to do! And lastly, a huge thanks to Bill Horne, because without him this past month I wouldn’t have been exposed to all these new opportunities!